Call CSC and speak to our office manager who will guide you to the professional who can help answer your questions. If you are ready to schedule they can take care of all the administration. If you are feeling unclear as to who should help your child, if they need help or what the assessment process entails, then a complimentary phone consultation will be set with the professional that can answer your questions. The process can be very confusing and often parents need support. Please don’t hesitate to reach out to our team. Once a plan has been established you will be supported through the assessment process by our Office Manager, who will answer any questions you may have. Please share information about your child’s strengths and challenges, likes and dislikes in the intake paperwork. Don’t hesitate to tell us anything that will be helpful in getting to know your child better before we meet them for the first time. During the assessment our team will make every effort to put your child at ease and help him enjoy his time at the center. This is also an assessment and learning session for the parent – the more a parent knows, the easier it is to parent their child. During occupational and speech assessments, the parent always stays with the child so that he or she remains emotionally safe, calm and happy. In an educational assessment, the child is usually of school age and the parent doesn’t need to stay in the room. Expect one or two 50-minute sessions. The assessment process is child-centered and may require additional sessions if your child requires frequent breaks due to difficulties with attention and emotional regulation. What do I tell my child about the assessment? Please let your child know that this will be a fun experience. For young children, the parent should tell their child they are coming to a gym to play with a teacher and may participate in fun activities like jumping, swinging, coloring and writing. The parent will stay with the child during the entire assessment. For school-aged children, parents should tell them that the “teacher” is going to help them understand and learn more about the things in school that are easy and hard for them. Once we know what’s difficult, we can work to make it easier. 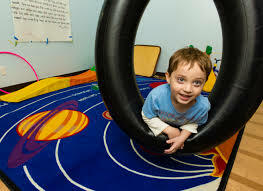 Once a baseline is established, the child is re-assessed at certain points in the treatment process. We are always looking at the child’s individual trajectory, and the assessment and treatment process is constantly recalibrated to ensure that the child continues on a pathway of achievement.